William Gordon Radcliffe was born in New Westminster, British Columbia, Canada on 24 September 1919, and was educated at New Westminster Central School and I J Fopp Technical High School. In March 1939, suspecting that war was on its way, Radcliffe travelled to England with his friend Howard Godfrey, and volunteered to join the RAF as a ground crew mechanic. Over the next three years he developed the skills which Joe McCarthy would come to rely on later in the war. In 1942 the RAF decided to dispense with the second pilot and institute the new position of flight engineer in its heavy bomber squadrons. Many ground crew saw this as their chance to fly, and amongst these was the young Canadian. Radcliffe was sent to the No 4 School of Technical Training at St Athans in Wales, and qualified as a flight engineer in July 1942. He was posted to 97 Squadron and flew on his first operation on 10 September 1942. A few days later, he had teamed up with Joe McCarthy and together with Ron Batson and Len Eaton became the nucleus of a crew which would stay together for almost two years. Radcliffe was also the owner of the crew’s mascot, a small stuffed Panda Bear which he would tuck into his boot on every flight. Its features were also copied onto the nose art on several of the crew’s regular aircraft. You usually get a nice easy trip for the first time and we were told this one was going to be fairly easy. But it didn’t turn out that way. … [W]hen we got up to 10,000 feet we ran into an electrical storm. It sure was pretty at first seeing sparks and flashes all over the windscreen and flashes all over the wings and fuselage and the tips of the props were glowing. But then it started to ice up and then the trouble started. We climbed right up to 15 or 16 thousand and we were still in it. We’d pass through a cloud with a negative charge and then hit one with a positive and the result was a big blinding flash that scared the daylight out of me. We weren’t much troubled by Jerry and we made the target O.K. and just managed to bomb through a gap in the clouds but couldn’t see the results. Coming back it got worse and we ran into a lot more ice. We must have dropped over 14,000 feet in less than nothing and the rapid change in temperature or the ice cracked the perspex windows on each side of the cabin and blew a two foot hole out of each side. Believe me then I was scared. I thought for sure we had been hit, my log and the navigator’s log, pencil and instruments etc just vanished outside. As soon as I realised what happened, I looked out and saw that we were skimming the tree tops of France. You could see the roads and houses plainly and we passed over a large town that didn’t seem to be blacked out at all. We got everything under control again and made some height to cross the coast. When we got back to the aerodrome we couldn’t get any answer from our radio and after half an hour of circling we had to land by signals. When we got down we found the aerial inside the kite instead of outside. It must have broken off in the storm and come through the window. Believe me I was relieved to find some of the other crews were scared as much as we were. Mac is a wizard at handling the machine. If it hadn’t of been for him … I think if I had to go through these storm on every trip I’d be grey before I’m 24. Fortunately not every operation was as eventful as this, and Radcliffe went on to complete his full tour with McCarthy by March 1943. The whole crew was then transferred to the new 617 Squadron for “just one more trip”. We decided that we’d map-read through the Zieder Zee and go home the way we came in. We scooted up the Zieder Zee. My engineer had flown with me on many, many trips. He and I always used to argue about speed and he’d say “No we’ve got to save gas, we’ve got to save gas.” He’d never give me my speed. But this night, coming out I was saying “Cut those motors back, you’re going to burn them out.” He had them set right up to the max and we were really tooting along. He had it all set like that until we got out into the middle of the North Sea. Radcliffe went on to fly with McCarthy throughout the rest of their second tour. He was commissioned in November 1943, and awarded the DFC in June 1944. After coming off operations, he served in training units for the remainder of the war, returning to Canada in February 1945. After the war he became a Customs and Excise Officer, and was also attached to the recruiting branch of the RCAF Reserve. Bill Radcliffe died on 5 July 1952 when his car failed to go round a bend in the road, went into the Fraser River where he drowned. It was thought he had had a blackout. He was cremated and his ashes were scattered by his colleagues in the RCAF Reserve over his favourite mountain, Burnaby Mountain in Canada (also known as Eagle Mountain). He had married Joyce Palfreyman, an English WAAF, and they had three children. Following his death, Joyce returned to the UK with the children to be nearer her own family. Footnote: It is interesting to note that there were two Canadian-born flight engineers on the Dams Raid. Both joined the RAF as ground staff before the war, and became flight engineers when the positions became available in 1942. The other was Sgt Charles Brennan in John Hopgood’s crew who was born in Calgary, Alberta in 1916. His family emigrated back to the UK in 1928. Thanks to Dorothy Bailey for help with this article. Survived war. Died 5 July 1952. This photograph has been used in a number of books and although I’ve never seen a photo credit, my mother, Nell Rodger has stated that it was taken by my father Dave Rodger. That explains his absence in the shot. Mom tells that prior to his departure overseas she had gifted him a new camera. It would be interesting to find out who colourized the shot. Sorry to disappoint you, Patti, but this picture was one of a series all taken at Scampton on the same day in July 1943 by an official RAF photographer. They include one of Guy Gibson sitting in a field reading a book and another taken in his office showing him looking at aircraft recognition pictures with David Maltby. Colour photography was rare in those days, but for some reason the RAF must have decided to use it on this shoot. The original colour transparencies are now in the Imperial War Museum photo archive – I saw them there in 2007. I’ve often wondered why your father wasn’t in the picture. He must have been off the base that day. Hi Charles ,just to add a bit more to this and confirm what Patti has said ,Johnny Johnson who is in the photo also told me that Dave Rodger had taken the photo with his new camera .Apparently there are a number of photo’s with Dave missing due to that reason . Do you know who owns copyright .? You will note here that the photographer is listed as Royal Air Force official photographer. The copyright rests with the IWM, but you can reproduce it for non-commercial purposes, such as on this blog, providing you acknowledge the IWM. On the other hand if you want to use it in a book or magazine or on TV, then you have to pay a reproduction fee. There is another photograph taken of all the McCarthy crew except Dave Rodger, which is on p81 of Dave Birrell’s book. I wonder if this was the one taken by Dave? My father was William Radcliffe, Flight Engineer, one of the young airmen in the coloured photograph being discussed (second from the right). When I was asked by the Antiques Roadshow who had permission for this photograph to be published I was able to tell them that I have a book which has the photograph on the back cover (Big Joe McCarthy The RCAF’s American Dambuster) and it was included “courtesy Imperial War Museum”. 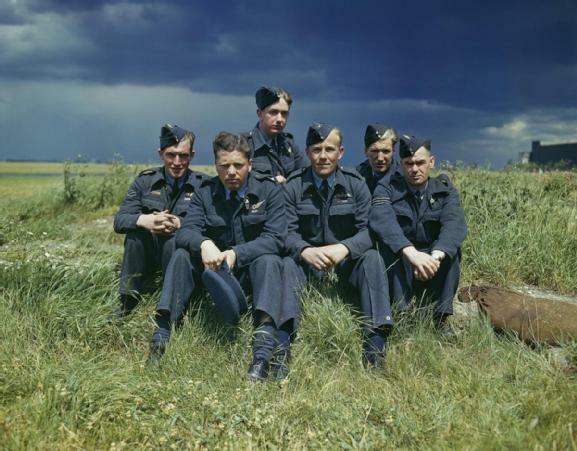 Kevin Wilson’s book Bomber Boys The RAF Offensive of 1943 also has this photograph on the cover sheet and it has been credited to Hulton Getty and IWM and Jonathan Falconer’s The Dam Busters – Breaking The Great Dams of Germany, 16-17 May 1943 also credits this photograph to (IWM TR1128). I think that as the photograph has been used in so many books/articles, being one of only a few coloured photographs, that the permission needed has possibly gone by the board but that it probably is the property of the Imperial War Museum. None of this really helps to confirm who took the photograph but I feel it is a professional photographer who did the deed. Could well of been Charles , i know the mists of time can cloud some peoples memorys. I have seen the photo’s you mention and do tend to agree with you on this .